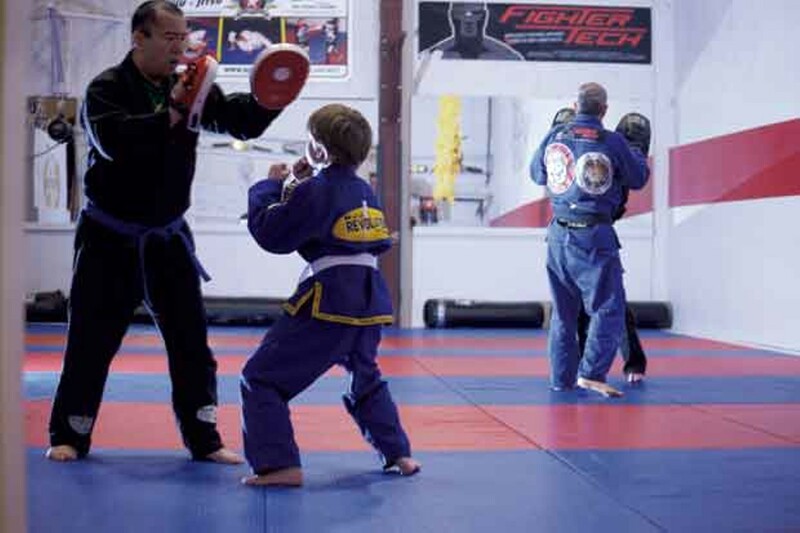 Brazilian Jiu-Jitsu | Fit Families | Kids VT - small people, big ideas! I had some reservations when I signed my family up for an introductory class at Vermont Brazilian Jiu-Jitsu and Self-Defense Academy in Williston. I didn't know much about the South American martial art, so I pictured the brutal attacks I've seen on the TV show "The Ultimate Fighter." My fears vanished as soon as I met instructor Júlio "Foca" Fernandez. A former champion Brazilian surfer, who holds a sixth-degree black belt in jiu-jitsu, Fernandez has an infectious smile and warm sense of humor. My children — Sean, 7, Sophia, 5, and Maggie, 3 — had also been apprehensive about the class, but Fernandez's friendliness put them at ease. Class began with a proper handshake, which Fernandez demonstrated. Confidence and respect are paramount in jiu-jitsu. Eye contact, a firm grip and a clear self-introduction are as important as sparring skills, he explained. My children stood a little taller after their handshake lesson and were ready to get down to jiu-jitsu basics. The sport, which focuses on grappling and ground fighting, originated from the Japanese martial art Judo. Jiu-jitsu is designed to enhance strength, flexibility, balance and cardio-respiratory fitness. It's built around the concept that with the right technique, a smaller, weaker person can effectively defend against a bigger, stronger opponent. My petite 5-year-old, Sophia, was delighted to hear this. 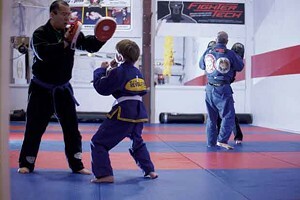 Fernandez has trained in jiu-jitsu for 35 years, including under Brazilian jiu-jitsu legend Carlson Gracie Sr., whose family brought the sport to the U.S. Fernandez designed his children's class to promote self-esteem, discipline, "bully-proofing," cooperation with peers and overall health and well-being. His classes are multiage, which he believes keeps students motivated to emulate their older peers. We dove right into footwork drills focused on balance and coordination. Using a prop resembling a ladder on the floor, Fernandez showed us how to leap in and out of the rungs, encouraging and cheering us on as though we were in the ring. The fast-paced drills felt awkward at times, but Fernandez's playfulness kept us engaged. Our favorite move? The equally challenging and silly "gorilla," which involved getting on all fours while strategically moving our hands and feet around the rungs. After floor drills, we moved on to some punch exercises using pads: left punch, right punch, squat, repeat. My 7-year-old, Sean, was timid at first, but with a little encouragement from Fernandez, all three kids were turning, punching and ducking at a whirlwind pace. In between sparring exercises, Fernandez taught us several different types of jumping jacks. If a student displays bad behavior in class, he said, he often makes the whole class sweat it out with a set of jumping jacks. Fernandez wants his students to have fun, but he expects respect, too. Belt promotions, he told us, are "earned, not given." In our final exercise, Fernandez taught us defense skills using a swimming noodle to swipe at our heads and bodies. He showed us how to quickly move our arms into defense positions in order to block his attacks. It was exhausting, but exhilarating. Sweaty and tired, we took turns at the water fountain after class wrapped up. Fernandez loves to watch as kids learning jiu-jitsu develop "confidence, energy and spirit," he told me later. For Fernandez, the sport is about much more than physical strength; it's about building inner strength to "resist peer pressure and overcome tough times and negative aspects of life." As we headed home, my kids were full of energy, clamoring to talk about what they'd learned. The older two begged to enroll in more classes. Five-year-old Sophia couldn't believe what she'd done. "Wow," she remarked. "I never knew I was that strong!" Vermont Brazilian Jiu-Jitsu and Self-Defense Academy offers prospective students a trial class free of charge. Multiage children's classes are held Wednesdays at 5 p.m. and Saturdays at 9 a.m. Discounts are available for families who enroll together. Parent enrollment in children's classes is encouraged. 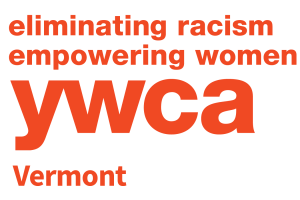 For more information, visit vermontbjj.com.